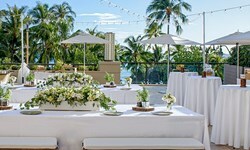 Hyatt Regency Waikiki Resort & Spa - Wedding Venue and Packages | The Future Mrs.
Envision the destination wedding of your dreams in beautiful Waikiki Beach. Our romantic beach resort features gorgeous venues with incredible views, diverse dining and a peaceful spa so you can enjoy a destination wedding in paradise. From our remarkable Waikiki wedding venues to luxury accommodations, our stunning hotel overlooking the beach has everything you need to create the perfect celebration for your family and friends. Say your vows under the blue Hawaiian skies, with the backdrop of the sparkling Pacific Ocean on the Na Lea Terrace. Enjoy a grand celebration for 500 guests in the elegance of the Regency Ballroom where you can dance the night away under the crystal chandeliers. To make it all happen smoothly, our wedding planning specialists will help you with every detail, from exceptional cuisine to the décor. Now all you have to do is enjoy every moment.